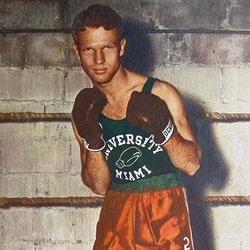 Combining clever boxing and fierce punching, UM boxing captain Archie Slaten scored five consecutive victories without a setback as spark of the 1953 ring squad. A year ago, as U.S. representative to the Olympics in Helsinki, Slaten was struck by misfortune and was forced to sit out what would have been the greatest moment of his pugilistic career. The 132-pounder from Chattanooga, Tenn.,went undefeated in six bouts a year ago, won the national intercollegiate boxing crown at Madison, WI, and then climaxed his greatest ring year by winning the U.S. Olympic trials in Kansas City, Missouri. The likable warrior went to Helsinki, Finland, during the summer to carry Uncle Sam's colors into the international ring competition. But on the eve of the biggest bout of his life, Slaten suffered an appendicitis attack and was forced into a spectator role as his teammates brought back six world championships. Through the South Carolina match, Slaten had entered the ring 37 times for the UM,and had his armed raised in victory on 36 occasions. A senior and UM's first representative to the Olympics, his departure will leave a large gap in future Miami mitt squads.